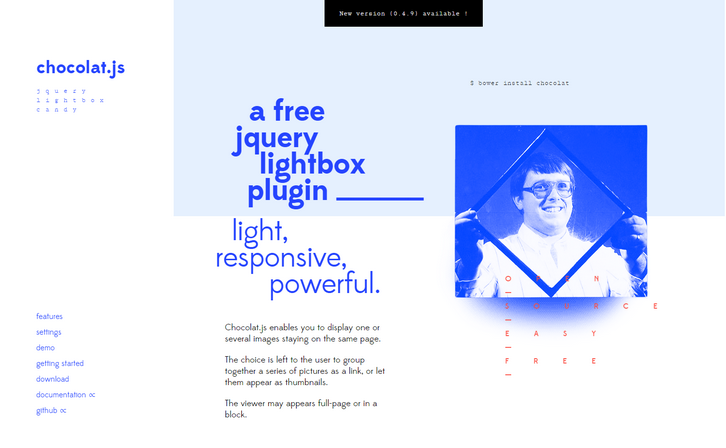 Chocolat.js enables you to display one or several images staying on the same page. The choice is left to the user to group together a series of pictures as a link, or let them appear as thumbnails. The viewer may appears full-page or in a block. Chocolat comes with an API and multiples CSS classes which make it very handy to use for advanced users, and very easy to use for newbies. Chocolat works well with all major browser. It has been tested on : IE7+, firefox, chrome, opera, safari. That might be the most horrible website I’ve ever seen this week. Also the demo is quite horrible, too.